The new year may only just hav started – but wheelchair race ace Samantha Kinghorn is already looking towards the end of 2019. The World Championships, held every two years, will be held in Dubai in November. And Sammi will have the chance to defend her double gold medal triumph from London 2017 in the 100 and 200 metres. The 23-year-old world record holder, from Gordon, is also aiming to make an impact in the 400 and 800 metres. Having automatic entry to the two other disciplines as defending champion, she is focusing on the qualification stages for those events in May. Based in Glasgow, she has begun training again after the festive season – with memories to inspire her of representing Scotland last year. Sammi has mentioned in recent interviews that the Commonwealth Games on Australia’s Gold Coast was her highlight of 2018. She just missed out on a podium place in the marathon – not her usual event – but was proud to wear Scottish colours once again. 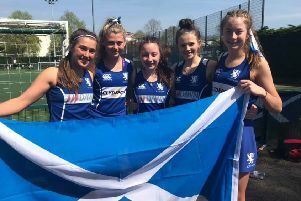 “I really enjoyed it – it’s always so great to compete for Scotland and you only get to do it once every four years, so it was really nice to do that,” she said. Because Sammi’s normal sprint events were not part of the Games, she had to undertake completely different training for the marathon. She felt she had acclimatised quite well but the heat on the day was very tough. More recently, Sammi took part in the Great Scottish Run and Jedburgh Road Festival. She usually aimed to tackle a couple of 10Ks before the winter, she said, but Jed, particluarly, was special, as it was the closest one to home – “good fun and always enjoyable”. In the months ahead, memories of her London triumph will blend with the ambitions for Dubai 2019.